If you don't have your own set of wheels, there are plenty of bike shops and access points across the region where you can hire a bike. Based in Tadcaster, close to Leeds, Wetherby, York and Harrogate, Cycle Sense offer a range of different bike hire. If two wheels don't take your fancy why not try a tandem for the day? Cycle Sense can also recommend cycle routes for you to explore. To find out whether there is a Bike&Go at your local station click the map below. Find more places to hire a bike by clicking the 'Bike Shop' tab above and toggling to 'Bike Rentals' or by clicking here. The Wyke Beck Way provides ideal options for new cyclists. Begin at Roundhay Park and follow the Wyke Beck Way down the valley to Temple Newsam. A visit to Meanwood Urban Farm on the Alwoodley to City Centre Route is also a good family day out. The towpaths also provide easy cycling and a great way to access some of Leeds’ best museums. The Cycle Route site also offer a wide range of cycle routes tried and tested by novice and experienced cyclists. Along with the route itself users also give a short explanation of what you can expect in terms of difficulty and road quality along with landmarks you can visit a long the way. For example, if you're out and about on your bike in Huddersfield why not try the Huddersfield to Northorpe Hall Cycle Route, mostly off-road, tarmac route with a nice bike shop to visit on the way. If you're already pretty confident on a bike and want to give yourself more of a Challenge, there are tons of routes to take your pick from. Why not try the West Yorkshire Cycle Route which provides a challenging ride around the edge of the district. It is 150 miles long in total but there are opportunities for shorter, circular trips. See Leeds Council website for a description and map availability. Cycle Routes also provide more challenging routes with recommended landmarks to visit along the way. If you're a Wakefield resident and your choice of bike is mountain, try the 40 mile loop around the City, starting at Pugneys Water Park with a great Tea Room to visit on your way. 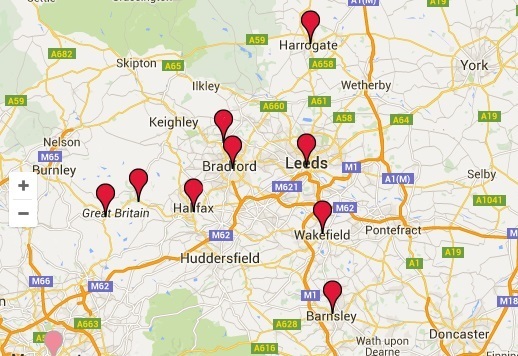 The Sustrans, Discover West Yorkshire Map also provides good recommended long distance routes. There is tons of other information out there to tickle your cycling fancy. Check out the following links for more information on cycle routes, bike hire and cycle advocacy groups.